“Make a job, don’t take a job” is a great piece of advice that Emma Jones, founder of Enterprise Nation, likes to give to young people. So, now that this year’s A-Level results have come out, what are your options? While university, apprenticeships and work placements are often touted as the next routes to take, there are also opportunities for budding young entrepreneurs. Before you start a business, make a simple plan of how much you think it will earn in sales, what costs it will have, and how much cash it will bring in. This is called a cashflow forecast and can be done easily on a set of three spreadsheets. This information could be crucial. For example, you could find out that your costs are higher than your sales, which means you might have to put your prices up. Or, it might tell you that you need to find some cash to cover your initial costs before the sales start coming in. Without a financial plan, you’ll be flying blind – which could be catastrophic for your business in the long run. Like any other business you must register with HMRC and you’ll have to pay taxes. Once your business is up and running, as well as how much cash it’s making, you also need to know how much profit it’s making (that’s its sales less its day-to-day running costs), because profit is the figure you will pay tax on. Don’t be like Ben and Jerry’s (of ice-cream fame) who, in their early days of starting the business, didn’t realise they were selling more than $1m worth of ice-cream a year and that they had to pay tax on it! Always stay on top of your cash flow – and know how much you owe to suppliers etc. Your business may need funds before you make your first sale. For example, if you want to start a jewellery business, you’ll need to buy the wire, beads, clasps and other materials to make some samples, or if you want to start a gaming website, you’ll need to be able to afford to develop the website, run updates etc. Remember: It can be long before any money starts coming in from customers. Look at the specialist sources of finance that are available to you. Check out The Prince’s Trust to see if you might be eligible for a grant or loan, or look at whether you’re eligible for a business loan. Liz Jackson – once named a Young Gun – is founder of business-to-business marketing agency Great Guns Marketing which is now a multi-million pound turnover company. She started the business before she had even turned 25, using financing from The Prince’s Trust – proof that even the best business ideas need a helping held in their infancy. Jackson goes on to explain that The Prince’s Trust also provided the support of a mentor, alongside financing, and says this mentor was crucial in helping her to develop her ideas. Her mentor also had a wealth of knowledge that he brought to the table, which was invaluable when it came to identifying – and finding solutions to – any problems that existed in her business. If you’re serious about starting and running your own business then a mentor can provide invaluable help, support and advice. But, as well as as mentor, make use of other contacts in your network and those that you may know through friends and family. Don’t forget the importance of help from friends and family as they might not only give you that magic business idea – like Fraser Doherty of global business SuperJam, whose grandmother taught him to make jam at the age of 14 – but also, potentially, they can help you find crucial business experience. Remember too that your friends and family could well be your first customers. Ask them to help you test your product or service, ask if they would pay what you are asking for it. And ask them for help in other ways too. If you know someone who is great with building websites, ask them for help building one for you. If you have a family member who is an expert with numbers, why not ask them to help you with your sales forecast? Or if you have a family member who works in HR or recruitment, why not ask them to help you recruit staff for your business? One of Virgin mogul Sir Richard Branson’s early business ideas was to grow Christmas trees for sale. When rabbits ate the Christmas tree seedlings, he chose to turn imminent business failure into success. He and his friend shot the marauding rabbits and sold them to a local butcher for a shilling each – which more than covered the cost of the Christmas tree plants! 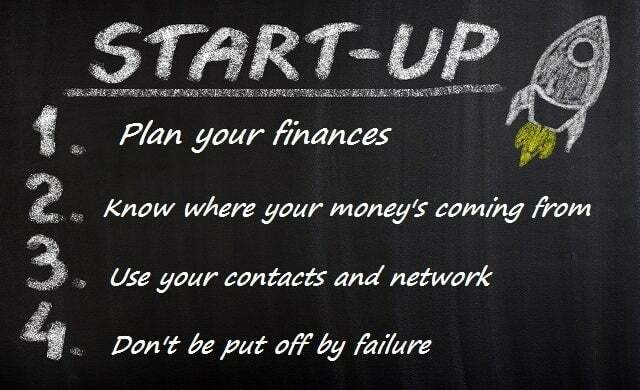 The moral of the story is that, if your first business idea doesn’t work then don’t give up – try something else! At the age of 18, it’s unlikely you’ll have a mortgage to pay or children to feed so it’s much easier to be flexible and you have far less to risk if it doesn’t work out. Plan your business carefully, seek advice and help from your contacts and keep it clean with HMRC, and you’re well on the way to business success. Like this blog? Now read the inspiring stories of 20 young entrepreneurs who are all aged 25 and under and running great UK businesses. Or, if you’re going to university and want to start a business part-time, view our guide to the best business opportunities for university entrepreneurs.